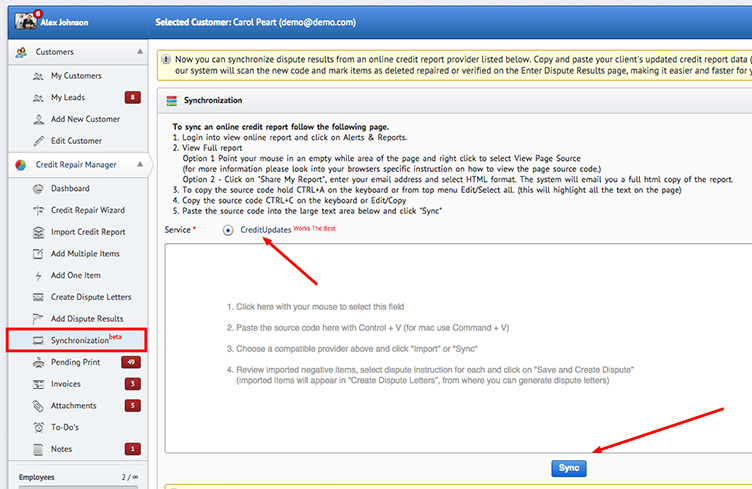 Import Your Client’s Credit Reports in seconds! No more typing of Credit Report data. It’s so easy and fast! The most robust & the fastest business solution for the Credit Repair Industry. 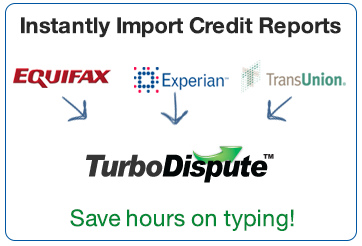 With TurboDispute Credit Repair Software you can easily import your clients’s credit reports in seconds and the system will import contact information, address, credit scores, credit inquiries and itemize all the derogatory items, one-by-one, saving you hundreds of hours of data entry every month, minimizing human error. Your clients can sign up for credit monitoring from ProCredit, Privacy Guard, Scoresense.com and Free Score 360 and services for $1 trial with instant reports and scores. Once they sign up they can provide you with their username and password and you will be able to Import your clients’ credit reports with one click including derogatory items, credit inquiries, and credit scores. This is an extra added feature that is only between you and your client. We do not provide a credit report or a credit score and your client will order the reports on their own if they choose so.